Berlin's IFA often sees some high-end gaming tech revealed at the event, and this year is no exception. After unveiling its curved, 21-inch Acer Predator 21 X laptop (price: $8999) at IFA 2016, the company has just revealed more products from its gaming-focused Predator series, including an 18-core desktop beast. 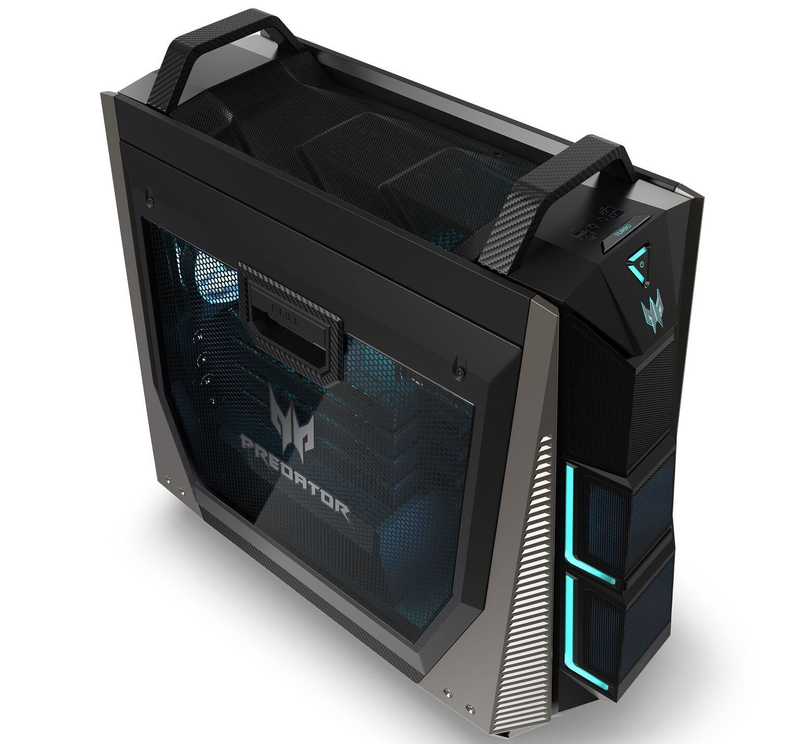 Acer claims the Predator Orion 9000 is the most powerful gaming desktop to date. Maxing out the specs means an 18-core/36-thread Intel Core i9 7980XE, three M.2 SSD slots, and DDR4 quad-channel memory that goes up to 128GB. As for graphics cards, you get the choice of two GTX 1080 Ti GPUs in SLI, or four Radeon RX Vega cards in CrossFire. Keeping all that high-end hardware cool is a closed-loop CPU liquid-cooling solution and the company’s patented IceTunnel 2.0 airflow management tech, which “separates the system into several thermal zones, each with an individual airflow tunnel to expel heat.” There’s also space for up to five 120mm fans that create a positive pressure air channel. The Predator Orion 9000 sports customizable RGB lighting down the sides of the front bezel, and users can choose RGB fans if they wish. To make the PC more portable, it comes with a pair of handles and a set of wheels. The Orion 9000 line will launch in December, with prices starting at $2000. If you’ve got your eye on the highest 7980XE option, expect to pay for the privilege – Intel’s most expensive Core i9 chip costs $1999 alone. If you’re going to pay an eye-watering amount of money for a PC, you may as well get a snazzy monitor that can take advantage of all that power. Luckily, Acer has you covered with its Predator X35 display. The curved, 35-inch ultrawide boasts a 3440 x 1440 resolution and ticks virtually every box when it comes to features: 200Hz refresh rate, 4ms response time, HDR support, G-Sync, and 1000 nits brightness. It’s set to launch during the first quarter of 2018. No word yet on the (doubtlessly high) price. Other Acer products on show included the $300 Predator Galea 500 gaming headset, which features Acer’s TrueHarmony 3D Soundscape technology. There’s also the $80 Predator Cestus 500 gaming mouse, which has a “dual switch” design that enables users to switch between light and heavier click resistance.